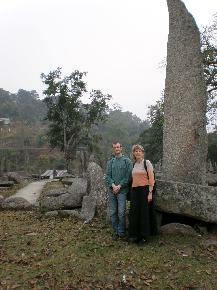 Monolith is a symbol of remembrance in the Jaintia Hills. The cluster of monoliths erected to mark the reigns of the erstwhile Jaintia King is a significant event in the history of Meghalaya. This cluster of Monoliths are found in Nartiang, a village about 22 km from Jowai, the district headquarter of Jaintia Hills, about 60 km from Shillong. Jaintia's is a tribe in Meghalaya who predominates the Jaintia Hills District. The site can be literally called a garden of monoliths. These monoliths cover a wide complex of about 100 m in diameter. The menhirs are locally known as Ki Moo Shynrang, and dolmens are known as Ki Moo Kynthai. Moo Iong Syiem, the tallest and biggest of the monoliths, is about 8 m height, 2 m breadth and 0.46 m thickness. It was erected by U mar Phalyngki, a trusted lieutenant of the Jaintia kings. The followers of the erstwhile Jaintia Kings U Marphalangki and U Luh Lyngshkor Lamare erected the other monoliths in the early 17th century. In ancient times Nartiang used to be the summer capital of the Jaintia rulers, who spent about six months here. Some scholars say that these monoliths were erected in memory of the establishment of the market from Raliang to Nartiang. Whatever the history be the site is splendid. It's an example of man's perfect imagination to make things look different and remarkable. Anybody visiting this site will be bowled. Alaister, a tourist from Boston says, "It's an amazing location. Man can really do wonderful things". Arshad Alam, a tourist from Rajasthan said, "This is an undiscovered tourist destination. It should be publicized that the world's tallest monoliths is located here in Nartiang. India should be proud of it". Going down to learn more about the history of this site it was found that on one rainy afternoon U Luh Lyngshkor, Jaintia ruler went to an old woman's hut at Raliang, a village near Nartiang seeking for a ‘Knub' (a bamboo cape used by the locals to protect themselves from rain and it is hung from the head and runs down the back). But the woman declined Luh's request by insisting that he being a well-built man should use the giant stone slab at the market in Raliang to shelter himself. On hearing this, Luh went to the market and used the giant stone slab for his shelter from the rain. Luh carried the slab till he reached Nartiang where he kept the giant stone slab and this event marked the shifting of the market from Raliang to Nartiang. Since then the market at Raliang ceased to exist. 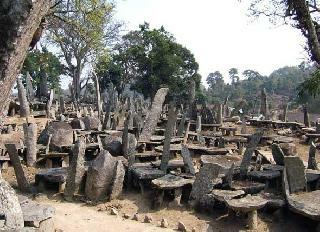 Nartiang market place is located to the north of Nartiang Monoliths. Local religious pujas are held at Law Mulong, i.e. this site, which is locally called by this name.